Get your video and still cameras ready, because we'll see with Dolphins (Nai'a), Whales (Kohola) [in season], Green Sea Turtles (Honu), and Flying Fish (Malolo) along the way! When we do meet up with the dolphins and whales, we'll stop the boat, and sit with them as our knowledgeable crew will tell you everything you want to know about these amazing and beautiful creatures. After an exciting ride up the coast, we'll enjoy an hour of snorkeling in the pristine waters off Oahu's western coastline. 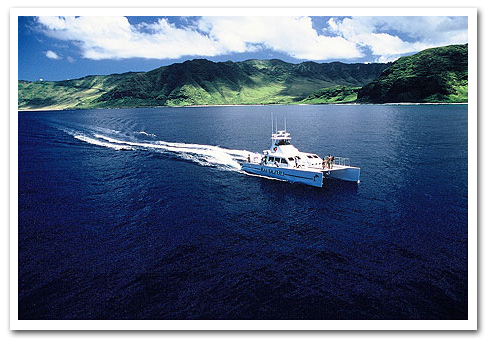 We provide the best of snorkeling equipment for you to enjoy as you swim in the sparkling blue water of Makua amongst unspoiled reef and sea life where no other tours take you. While still tingling from your snorkeling and dolphin watching experience, enjoy our sumptuous buffet, and sip on a tropical Mai Tai, an ice-cold beer or any of our other beverages to your heart's content. Let the cool Hawaiian breeze relax your soul as we make our way back down the coast to our luxurious Ko 'Olina Marina home. Spacious cabin with lots of padded seating, perfect for enjoying the view in comfort. Goes about 20 miles round trip, and emphasizes going all the way to beautiful Makua Valley, Yokohama Beach and even Ka'ena Point during sunset time. 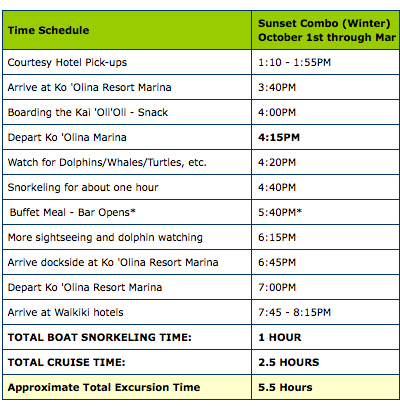 Has a total boat time (snorkeling plus cruise/watching time) of 2.5 HOURS. Only available Tuesday, Thursday or Saturday. ALL CRUISES include one hour on a snorkel site of the captain's choosing (according to conditions of the day), with the same professional quality gear and instruction from the friendly crew. If not snorkeling on the sunset cruise, alcohol beverages will be available after the last snorkeler enters the water. This is a barefoot cruise and your shoes will be stored at the dock. If you do not see dolphins and/or whales, you may return for another cruise (subject to space availability. Meal, and transportation if needed, will be charged). Please call us for more information about seasonal changes.